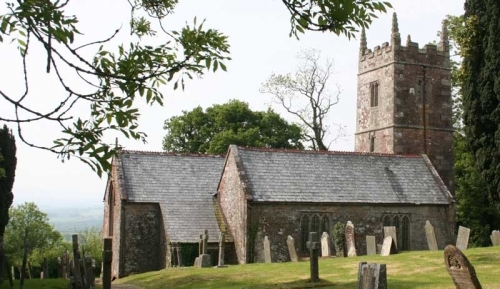 The Parish of Highampton is a microcosm of Devon itself. A small population and a large land area set in beautiful countryside. Highampton is a parish of approximately 110 dwellings, with around 236 on the electoral role, spread over an area of about four square miles. It stands on a conspicuous ridge from which there are splendid views, particularly of Dartmoor, although Exmoor can also be seen. The Church of the Holy Cross dominates the skyline and dates from Norman times, with extensive restoration in the fifteenth century and more in Victorian times. The Methodist Chapel, on the Northlew road, outside the village, closed a few years ago due to lack of members – but not a lack of financial support. The village itself is unusual in not being built around the Church. It developed on the Main road used by the stage-coaches on less high ground, although some farm buildings next to the church show signs of having been houses. The local Public House, a former coaching stop' and village store still exist and are much appreciated by the local population as well as passing Motorists. An outreach Post Office service operates from the Village Hall. Highampton is very fortunate to still have a Primary School. The School employs a number of part time staff as well as the core teaching staff; all are very dedicated and the children from Highampton and Sheepwash get an excellent education, including many after School Clubs. The School is able to make use of the Village Hall, opened in 1994, when extra space is required, although in recent years the school has been substantially enlarged and is well equipped with a modern computer suite.